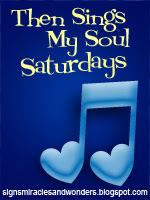 It's Then Sings My Soul Saturday when I get to link up with Amy of Signs, Miracles and Wonders. I love those mountaintop experiences. Have you ever had them? You know, those times when life is going along smoothly and it's so ...easy to praise God. But what happens when you're in a valley? God never promised that this life would be easy. 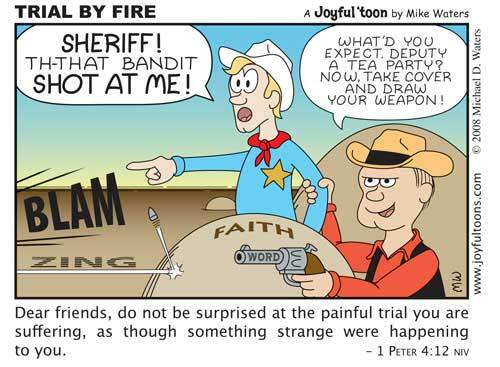 In fact, 1 Peter 4 tells us to expect trials. What is your response when you find yourself in a season of trials and challenges? Do you continue to praise God? Or do you complain that life is so hard? The song I chose for this week is called "God on the Mountain" and Linda Randle sings it so beautifully. God is the God on the mountain. But God is also God in the valley. I believe my faith is being stretched. It continues to grow in the valleys of my life as I learn to cling to Him alone. Do you make the choice to praise God regardless of your circumstances? "The God of the day is still God in the night." What beautiful lyrics and such a beautiful singer. You are definitely one of those godly women that I've seen praise God consistently, regardless of what is going on in your life. Thanks for being an inspiration, Debbie! Great song! =) She is an awesome singer - and I loved the harmonica that accompanied the song =) So beautiful. Love the message! God makes the wrong things right - He is the God of the good and the bad times. He is the same God day and night. I love the cartoon =) Very cute with a profound message! Hope you have a blessed Saturday! I have to confess that it's harder for me to be full of praise when life has valleys. The mountains are easy, valley's not so much. It's something I'm working on and it seems the older I get the more I understand the valleys, try not to get shook, and let my thankfulness for my life still shine. The valleys are a great time to rehearse to goodness of God in our lives like King David did as he lay upon his bed. I find if I do this, I am comforted and find hope. Thanks for sharing! What wonderful lyrics - God doesn't change even though our circumstances do! We are in the valley at our house. I needed to hear this song. Oh Debbie, such a strong message of comfort, knowing He never changes and is always there. Love this song and what a beautiful voice! Clinging to Him alone and being thankful for every blessing that comes to us is what I am experiencing also..and I am thankful for it and do praise Him for the good times ahead, though it is difficult, He is there. So glad to see that you are continuing to "praise God in the valley" - because by doing that you are honoring Him and assuring that when the next mountaintop experience comes your way - it will be all the sweeter. What a beautiful song and singing. I love how God never changes! i love, love, love the lyrics. so true! How perfect for me to hear this awesome song this morning. You blog is always a blessing to me. Thanks for being so sensitive to the spirits leading in your life. Blessings to you! I have not always responded to trials patiently waiting on the Lord. I would get anxious and wonder why I was going through whatever was happening at the time. I would murmur and I know I was grieving Holy Spirit. I have since learned my lesson and now I respond much differently in Jesus' name. I thank Him because He has promised to never leave me or forsake me! The God on the mountain is still God in the valley!! That's the bottom line that we all need to know. Loved this song Debbie... it's where we seem to spend the most time in life... I love the mountain tops, but the valley is where I learn to know Him the best. This cartoon is hilarious, Debbie! I'm praising Him too, whether valley or mountain top. Who else can rescue me? Happy Thanksgiving, my friend. I have long loved this song. It's one of those that brings a lump to my throat and a tear to my eye, knowing how faithful God has been to me on the mountains, and in the valleys. Great song of choice and message Debbie. Appreciate it so much. Blessings. Oh my sweet friend, I had trouble getting it to play here so went to YouTube. I so needed to hear this! Thank you for sharing it! But being human, I can sometimes slip into a slump - confused and feeling alone in my circumstances. But you are so right! We need to praise God regardless of what is happening in our life...for we are never alone! God will bring clarity in our confusion, calm in our chaos, and comfort in all our trials. He cares for each of us and will carry us through the deepest valleys, for even there, so is God. I love this! And what a great song, another new one for me! "goosebump" that was i felt while listening to the music, what a wonderful message and music. I just love listening to it. Thank you for sharing. Oh Debbie this is just another post to confirm the lessons that GOd has been teaching me these past days. I loved the words you wrote, and now this song. I have never heard it before. Thanks for sharing you heart once again.